Question: Give me the website for the result for SSLC Supplementary Examination of KSEEB? Karnataka Secondary Education Examination Board KSEEB has published the result for SSLC Supplementary Examination held in 2012 on 12th July, 2012. To get the result visit through the result section of the official website of the board and click on the link “SSLC Supplementary Examination Results 2012”. 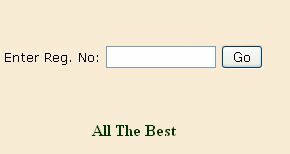 The result page looks like the following image where to get the result enter your registration number and click on go button.